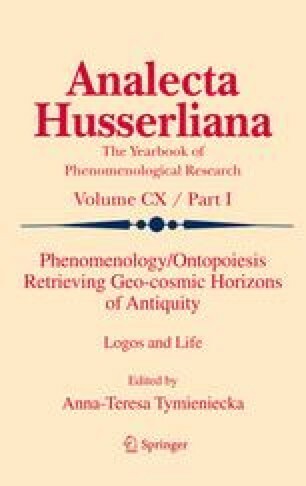 The author analyses the late Husserl’s phenomenology of time giving a new interpretation of the «now» which is based on statement that the «now» should be expressed by non-temporal terms. According to the author, this process of temporal devoid is present in the very late Husserlian considerations on lebendige Gegenwart and this process is threefold. The third level of freeing the «now» from temporality is “being of the form of the pure non-temporal «now»”. Derrida’s temporality of origin discloses the simultaneousness of objective ontology and objective consciousness. Dialectics of conversion of subjectivity into temporality, which is present in Derridean philosophy, requires a direct and an original insight in the difference. The Husserlian solution of the problem is reduced by the author to an explanation of the «now» as a noun. According to the author, this interpretation overcomes Derridean apories. Also, the paper shows the basic significance of the category of the «now»—that is devoid temporality on the most basic level—in the constitution of the consciousness ot time. Double character of the «now»—temporal and non-temporal—is a source of a cognitive tension but also it is a level of sociality.